The San Pedro Police Department is asking for assistance in the capture of George Martinez. He is wanted for escaping from police custody over a month ago. Anyone with information that can lead to his arrest please contact 206-2022 or call anonymously to Crime Stoppers at 0-800-922-8477. 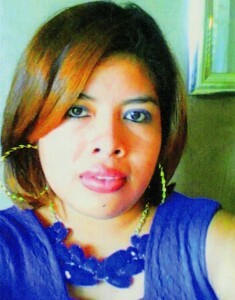 The public’s assistance is requested in locating Mindy Arucely Jordan Espino. She has been reported missing by the San Pedro Police Department by her husband and is believed to be in San Pedro Town against her will. Anyone with information on her whereabouts is asked to contact the San Pedro Police at 206-2022 or call anonymously to Crime Stoppers at 0-800-922-8477 or contact cell number 602-4513. A reward is being offered for information leading to her return. On Monday, February 8th at about 4PM, based upon information received, the San Pedro Police visited a residence located on Stadium Street in the San Pablo area. Upon arrival, the lifeless body of a male person was noticed in a seated posture on a plastic chair that was on the corridor of the house. He was later identified as 74-year-old Santos Elijio, a retired Belizean laborer. The body was transported to the San Pedro Otto Rodriguez Polyclinic II, where Dr. Renae Sersland pronounced him dead of natural causes at 4:23PM. According to the official report, Elijio was diabetic and had been sick with flu and fever. The body was inspected and showed no signs of injuries or any sort of attack, therefore foul play was ruled out. Elijio’s body was then transported to the morgue at the Karl Heusner Memorial Hospital where a post mortem examination took place. The post mortem examination certified the cause of death as ‘Cardiac Arrest’ due to hypertension and as a consequence of diabetes. Elijio will be greatly missed by family and friends.